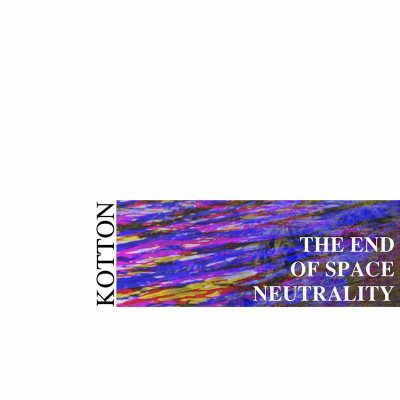 Travel through space with Kotton and their newest album, The End of Space Neutrality. From the way the music is crafted to the song titles, Kotton casts a trance. Kotton do not send listeners into another world with their psychedelic rock jams, but rather, to no world at all. Even their Bandcamp page is set up with space-evoking colors: a bright yellow and black, and a fading, waving logo. The six-track album is an entirely instrumental journey drifting through time and space. Although void of lyrics, the album is emotional and evocative, a little mysterious and enchanting, while aesthetically tense and anxious at times. The album opens with “Blind Astronomer,” a song that is more than eight minutes long. The slow-moving track begins with a soft distorted synthesized buzz and slowly integrates sounds from what seems to be a set of electric keys. “The Ordinator,” is in comparison, the grooviest track on the album, with a defined riff and a distinct beat to sway to. The electric guitar often steps to the forefront with mostly high-note chord progressions and sometimes quick low-note strums. During dramatic pauses, the guitar trades with drawn-out synthesized sounds and subtle whirs, while at other times, they accompany each other. The title-track has a defined riff, yet this song is more electric than spacey, but doesn’t entirely stray from the long drags of notes. Subtly, the drums and guitar drive the quicker pace, but often slow, then speed up again in a roller coaster kind of way. The song seemingly keeps to the rhythm, but when listening closely, the dynamic instrumental shifts are always changing—it’s just that the drums and guitar are more pronounced.